Brands are widely accepted as valuable assets for businesses large and small. However, when analyzing intellectual property or brand assets, the analyst needs to isolate the impact of a discrete component of an enterprise rather than analyzing the entire enterprise. Brand assets are typically the most significant intangible assets recognized in acquisition accounting and a valuable brand reflects the difference between better-than-average and lower-than-average product prices and profit margins. Unlike a trademark, patent or copyright, brands are typically bundles of different intellectual properties and intangible assets rather than a single legally-protected asset. Also, brand assets rarely generate much financial impact all by themselves. Without the existence and contribution of working capital, tangible assets, human capital, and other intangible assets employed by the business, brand assets cannot provide much financial benefit. Therefore, the dual challenge of identifying what constitutes a company's brand assets and the reliance on other assets and resources, can make quantifying the contribution of brand assets to financial performance difficult. As brands are accepted as potentially valuable assets, and often are a company's most valuable asset type, business owners, managers, and investors should know the value of this asset group. The concept of adding the value of acquired brand assets to an acquirer's balance sheet is not new. However, this valuation occurs in the context of an acquisition and may not provide useful information for the owner or manager of a company interested to know how brands are contributing to their company's performance or if their time, effort, and capital invested in brand development is achieving a reasonable return. Identify what intellectual properties and intangible assets constitute the company's brand assets. Identify what non-brand assets and resources are required by the company in order to generate revenues, profits and cash flows, and how the brand assets will contribute to financial performance and value. Quantify the value of the brand assets using valuation techniques based on the cost, income, and market approaches to valuation. An opinion regarding the value of brand assets may be required for a number of reasons, including financial reporting, tax compliance, transaction support, or to resolve disputes and litigation. From a strategic perspective, understanding the value of brand assets should contribute to more efficient allocation of business resources, more effective business management, and therefore, incremental financial returns. A recent client in a business and brand valuation assignment indicated, "every business owner should know the value of their business as well as which assets and activities are creating that value." This business owner felt it was important to know the value of his business, but more importantly, what activities and assets were driving that value. Whilst a bit simplistic, the essence of brand valuation is estimating the total value of the brand, what financial benefit does the brand create, and how will the brand contribute to future financial benefits. However, this definition does not help define a brand. Sometimes "brand value" is used to describe the difference between a company's market value and the value of its identifiable assets or essentially the value of unidentified intangibles and goodwill. To answer a business owner's question about the value of their brand, the answer needs to be more specific than all the value that is left over. Marketing-related intangible asset including, but not limited to, names, terms, signs, symbols, logos, and designs, or a combination of these, intended to identify goods, services or entities, or a combination of these, creating distinctive images and associations in the minds of stakeholders, thereby generating economic benefits/values. Thus, a brand can be different things for different businesses. For a business reliant on e-commerce, its website, domain name assets, and social media presence could be key components of its brand. For a business with a large and diverse product portfolio, brand assets could comprise both the corporate brand as well as marks, names, and logos used to identify individual products. As no two businesses are exactly alike, no two sets of brand assets will be alike. Regardless of the standard being applied- and before exploring techniques to quantify the total financial value of the brand -here are a few valuation basics. First, the value of any asset or resource is the present value of the future benefits expected to be derived from ownership of that asset or resource. Therefore, the value of brand assets should be equal to the present value of future benefits expected to be derived from ownership of the brand assets. All three valuation approaches quantify the present value of future benefits, but from differing contextual perspectives. Next, the Income Approach forecasts future benefits and discounts them to a present value. The Market Approach uses similar transactions to identify what others have paid for comparable future benefits. Finally, the Cost Approach quantifies the time and effort to replicate the resources needed to reap future benefits. Therefore, a brand valuation exercise should utilize and triangulate the three valuation approaches, and the value of a brand is based on the future benefits derived from owning the brand, observations of what others are willing to pay for similar future benefits, and/ or the investment required to replicate similar future benefits. As discussed, a brand can be hard to define. One company's brand assets are likely not to be the same as another company's brand assets. Typically, brand assets comprise a bundle of marketing assets used by a business to identify itself to customers, suppliers, stakeholders, and other partners. A trademark is the legal registration of a word, term, or logo used by the company in its branding efforts. A brand could include a collection of trademarks, domain names, websites, promotional materials and practices, policies and procedures, and more. In a recent assignment, our firm was asked by a potential acquirer if they could only acquire the history and heritage of a 100-year old family-owned Italian restaurant business.2 The acquirer was a high-net worth entrepreneur hoping to use the family's name and history to re-brand a food products line. In other words, the acquirer wanted the business name, and to be able to incorporate the history and heritage into its own marketing and promotional efforts, but was not interested in acquiring any physical assets, the target's website and domain name, or its operations. In this case, the brand assets were the target's name, history, and heritage. Typically, brand assets are some combination of the company's marketing assets. While there is no set or established listing of what can or cannot be included in a company's brand assets, it is important to define this bundle of assets at the beginning of each brand valuation assignment. Therefore, identification of what is included and what is not included in the brand is the first step in a brand valuation. (see Figure 1). Generally, brand assets would not include a company's technology or innovation assets. Patents, trade secrets, customer lists, and research contribute to the value of the firm, but separately from the same business' brand and marketing assets. Another basic and relevant concept is the context of the valuation assignment. Similar valuation approaches and tools can be employed to quantify both the value of brand assets as they are currently being used by the business that owns them; or to evaluate and quantify the value of an opportunity to use brand assets in an alternative manner. The assumptions used for each context will likely differ. For example, an existing brand used by a company to produce and sell cars and trucks to consumers will have a value based on its contribution to the financial performance of the original equipment manufacturer. This same brand may also have value if used in the marketing and sale of very different types of products or services, such as clothing, toys, or financing products. Recognizable brand extensions include Caterpillar-branded work clothes and Snickers ice cream bars. For valuation professionals, brand extension is an example of when a different context will yield different valuation results. The value of the Caterpillar, Snickers, or any other brand will differ if the context is the value contributed to existing operations or the value of the opportunity to use a brand in a new market. Both valuations are valid, but the context is different and therefore the valuation results should differ. Monopoly: One benefit of creating and building proprietary assets is to have something no one else does. The existence and use of unique assets should enable the business to position its products and services as unique and hopefully provide a competitive advantage. If the products are unique and can be differentiated from the company's competition, can pricing advantages or excess profit margins be measured? Permission: Owners of unique assets can benefit by granting permission to others to use their unique assets. This benefit of brand assets is typically measured by the financial performance of licenses, partnership contacts, or royalty compensation. Promotion: Valuable brand assets can help a business achieve additional unit sales (volumes), or reduce marketing costs. Brand recognition can reduce costs associated with reaching new customers or launching new products. If brand recognition allows the company to achieve the same sales volume with less marketing effort, the company should be achieving a measurable financial benefit. Litigation: Owners of some intellectual property assets have also been able to use the legal system to prevent new market entrants or receive damages awards. If the brand assets have been the subject of litigation, the net benefits (after considering the costs of pursuing litigation) can be considered as a financial benefit of owning the brand assets. Essentially, the second step in brand valuation focuses on identifying how the brand assets are contributing to value. Each of these four mechanisms can serve as the foundation for a forecast of future financial benefits. In calculating the value of brand assets, there are two types of valuation calculations that we have found provide the most reasonable valuation results. Both attempt to address the challenge of identifying the financial benefit derived specifically from the IP or brand assets. However, both of these calculations require a reasonable and well-supported forecast of future economic benefits, and forecasting future economic benefits for brand assets is subject to some guiding concepts. The first concept is that intellectual properties and brand assets have a finite useful life. In business valuation, a terminal or perpetual value is often used to quantify the future benefits the business is expected to accrue after the valuation analyst's discrete forecast period. While many components of brand assets can have legal protection for terms longer than most valuation analysts would care to forecast, most brands are not used indefinitely. Corporate brands may be used over the life of a corporation, but the product brands used for specific products and services will likely not be used forever. Also, most products that generate revenue and profits for the business will contribute revenues and profits for a limited time period. Most products are replaced by future generation products. If the valuation assignment is focused on a product brand, a terminal perpetual value should not be used. If the valuation assignment is focused on a bundle of brands, including a corporate name and product names, the analysts needs to make a judgment call. We often try to bundle and value product brands separate from corporate brand assets in order to distinguish between the contributions of these two different types of brand assets. The second concept is that for most products or services, the contribution of different forms of IP and intangible assets will change over the product's life cycle. Early in the product life cycle, technology and innovation assets distinguish the product from other competitors. As the product is used by more and more consumers, its reputation grows and the contribution of trademarks and other marketing assets increases. Powerful brands can help extend a product's lifecycle, maintain price premiums, and reduce marketing costs once the product has gained market acceptance. Therefore, when forecasting future benefits, we need to forecast the company's total revenues, expenses, profits, and cash flows; as well as develop a forecast for the key revenue generating products or business activities of the company. As brand assets will make different contributions at different times to the financial performance of the total company and the products that rely on brand assets, a product-level forecast is essential to determining the value of brand assets. 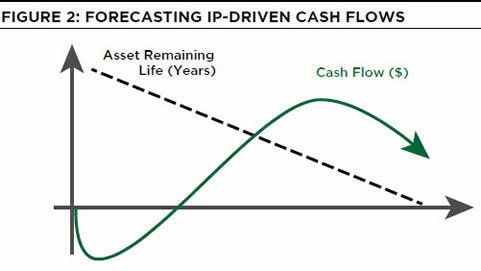 Often a product-level forecast resembles the cash flow pattern shown in Figure 2. Initial cash flows may be negative as investments made to design, build, and launch the product exceed earnings. As the product gains acceptance and initial investments decrease, cash flows may become positive. Eventually, the product ages and is replaced by future generation products and cash flow declines. With a forecast of future revenues, expenses, profits, and cash flows for both the business and the business' key operating activities, the next step is quantifying the portion of forecast future benefits that will be provided by the brand assets. As discussed, a brand cannot generate future benefits without the contribution of other assets and resources. The brand does not manufacture or distribute products, it does not provide services or design new products. Even in a trademark licensing context, where the licensee wishes to pay royalty compensation for only the use of registered words or marks, other assets and resources are needed by the licensor in order to negotiate, manage, and monitor the licensee. Therefore, the value of a business or business opportunity will always be greater than the value of brand assets used by the business or business opportunity. Also, the profits achieved by the business must be apportioned amongst all of the assets and resources used by the business, including the brand assets. The brand should not account for 100 percent of future financial benefits. Insert (see Figure 3). One of the two brand valuation techniques, we find useful, is an apportionment model. The apportionment calculation or apportionment model aims to quantify the contribution suggests, the value of any one asset, resource, or group of assets is a component of the total value of the business enterprise. This valuation balance sheet is essentially the same as an accounting balance sheet. On a balance sheet, all of the assets of the business are equal to the total capital utilized by the business. In the apportionment valuation balance sheet, all of the company's tangible and intangible assets are equal to the value of the enterprise. Valuation of the Entire Business: Using both a discounted cash flow, guideline transactions, and guideline company multiples, the first step is to calculate and reconcile an enterprise or total capitallevel value for the entire business. Forecast Each Source of Revenue (Products and Services): Starting with the total business forecast of future financial performance, we identify and group the company's revenue-generating activities by product, service line, or operating unit. A forecast of future revenues, expenses, and cash flows for each identified product group or operating unit is developed, apportioning shared expenses and resources in a logically informed manner as necessary. 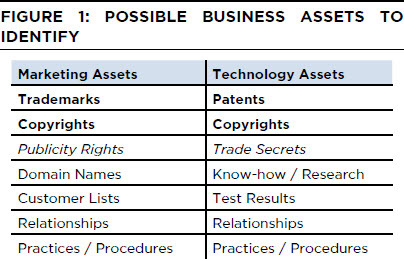 Identify Key Assets and Resources (IP and Intangibles): Based on the earlier analysis to identify what key IP, intangible, and tangible resources are used by the business, this step identifies how each product group or business unit relies on the company's assets and resources. Some products may rely on product-level or individual brands more than the corporate brand, therefore product-level brand assets would receive a greater apportionment of the product-level profits. Apportion Product-Level Benefits: After forecasting the financial benefits at the product-level, these benefits are apportioned amongst the company's assets and resources. One hundred percent of the forecast benefits must be apportioned or assigned to an identified asset or resources. This step requires reasoned judgement by the valuation analyst and an explanation of the facts and observations used to support the benefit apportionment decisions. Value the Forecast Apportionment Rates: The percent of product-level profits apportioned to each identified asset, including brand assets, are then summed. The value of each asset type is the present value of the product-level benefits apportioned to that asset. A corporate brand may have an apportionment from each and every one of the company's different products and services. Apply Concept of Equal Values: Based on the apportionment framework, the value calculated for all of the company's assets and resources must equal the value of the business. This serves as a reasonableness check for the valuation calculations of each asset and resources. If the total value calculated for each asset does not equal the value of the business, the assumptions and apportionment decisions need to be revisited and adjusted. Whether focused on the excess earnings achieved by products using one group of brand assets, or apportioning 100 percent of a company's financial benefits amongst the company's assets and resources, apportionment models are essentially an Income Approach. The second calculation method is based on the concept of a hypothetical license agreement where the company would pay a market rate of compensation to use its own brand assets. The relief from royalty (RfR) calculation assumes that the value of brand assets owned and used by a business would be equal to the present value of future compensation the company would need to pay if it did not own those same brand assets. RfR calculations assume that company would be able to license a comparable set of brand assets from a third party at compensation rates equivalent to those observed in marketplace transactions. To the extent possible, this calculation requires forecasting the costs and benefits to both the licensor and the licensee. The goal is to calculate the value of the hypothetical license to both parties in the transaction-the licensee and the licensor. Forecasting future licensing compensation requires identification of a reasonable royalty rate and consideration of all the non-royalty economic and financial costs and benefits related to use of the brand assets. In many license transactions, there are marketing commitments, upfront payments, milestone payments, tiered royalties, and minimum payments. All of these forms of compensation should be included in an RfR valuation calculation. In other words, simply slapping a market average royalty on gross sales should not constitute an acceptable RfR calculation. As the RfR calculation relies on a forecast of future benefits and discounting future benefits to a present value using a reasonable discount rate, it is essentially an Income Approach. However, the research and selection of reasonable royalty rates often resembles the search for comparable transaction multiples, and the RfR relies upon observations of comparable market transactions, making it a hybrid Market and Income Approach to valuation. Both the apportionment model and RfR calculations have flaws and limitations. The apportionment model relies on access to a significant level of information about productlevel performance and the inter-dependencies of a company's assets and resources that may be difficult to obtain without direct access to the company's owners and managers. The relief from royalty calculation relies on market observations of compensation paid by licensees; and accurate data describing the key compensation components of comparable transactions may not exist. Both calculations require reasoned judgment by the valuation analyst and a thorough explanation of the logic, facts, and observations used by the analyst to support their opinions. If possible, it is always best to perform both types of calculations and reconcile the valuation results. Understanding and accepting that no valuation model is perfect for every valuation scenario, these two calculations have provided valuable insight for business owners and managers. As brand assets become an increasing component of the total value of today's businesses, valuation analysts should be able to convey both the value of their client's total business enterprise and the value of the business' key assets. Brand valuation offers a unique opportunity to provide valuable insights to our clients and to use our analytical skills to expand our practices. Nevium's experts are trial-tested IP custom & practice damages experts who take a hands-on approach with all their IP litigation assignments. Whether you are in need of an expert to calculate economic damages as lost profits / unjust enrichment, give an opinion on specific business clauses in a license agreement or to leverage Internet and Social Media analytics to prove or disapprove infringement, Nevium has the experience and expertise.